Old contacts can no longer be used so you will need to delete contacts from the old versions of Smart Office and add your contacts again. 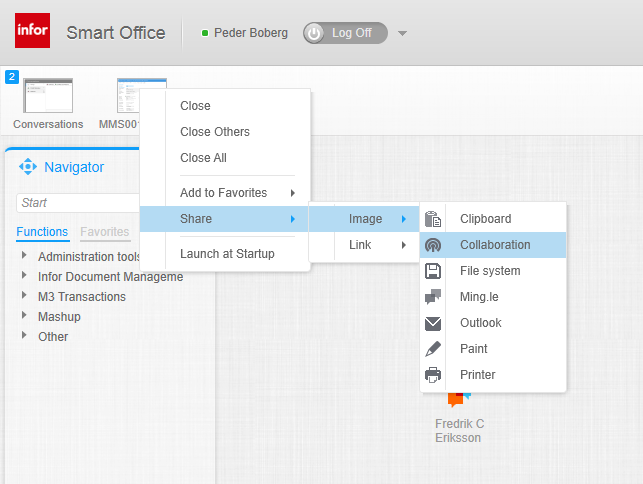 But you will see that this is a small effort compared to the new functionality that we provide in Smart Office 10.2. The changes include updates to the UI, several new features and more straightforward way of communicating and sharing information with your fellow colleagues. Much has happened to the UI since the last version. 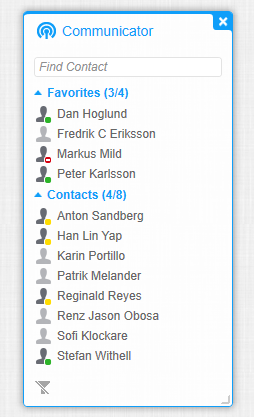 First and foremost a contact card has been placed in the Smart Office title bar to let you manage, e.g. the awareness of your contact. All awareness states except ‘Away’ can be set manually since ‘Away’ is automatically set when the user has been inactive for a set amount of time. The Communicator widget has been given a new design supporting personal contacts and favorites, filtering offline contacts and adding new contacts via search. The chat window or, as we call it, the Conversations window has been given a completely new tab design where each ongoing conversation is given its own tab. 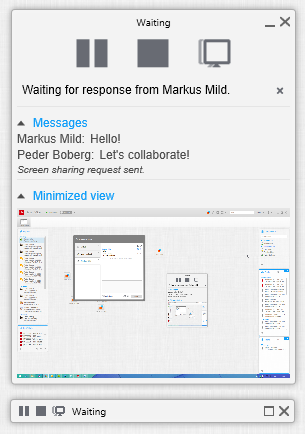 As the screenshot of the Conversations window above shows, instant messaging in Smart Office now supports group converstaions. The selected tab in the screenshot is a group conversation between three users, i.e. myself, Markus Mild and Dan Hoglund. Additional contacts can be added via the add participant icon in the top right corner of the conversation. One-to-one conversations also supports searchable history logging via the document button to the right of the add participant button. Another added feature that only applies to one-to-one conversations is file transfers via the attachment button next to the send button. 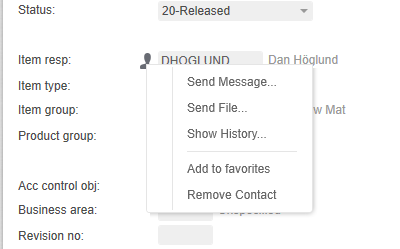 Clicking it will open a context menu where the user can choose between sending a file and sending a custom screenshot. All types of files can be sent but there will be a file size restriction. The coolest functionality that has been added in this version is however the possibility of sharing your screen in real time to any number of participants in a conversation. Clicking the screen sharing button next to the attach button will show a context menu where the user can choose between sharing his/her entire screen or a specific running application in Smart Office. The view of the participants of the screen sharing session is shown in the image below. The conversation is moved to another window where the participant can view the ongoing screen sharing session as well as communicate in the conversation on the left hand side as usual. The collaboration feature has been integrated to Smart Office in an intuitive and straightforward way in this new release. The example below shows the detail panel of an item in Item. Open where the person responsible for the item is shown as a collaboration contact. To communicate with this person directly, simply left click the icon to open a conversation dialog or right click to open a context menu with additional options. We believe that this functionality will facilitate everyday work and let users solve their problems quickly and efficiently. Another new feature in this release is the possibility to quickly share Smart Office content such as Bookmarks, Links, Images, Widgets etc. This is of course supported by the collaboration framework as in the following scenario. The current user wants to share an image of the application Item. Open. This can be done in two ways, either by right clicking the related task in the task bar or via Tools in the application itself. 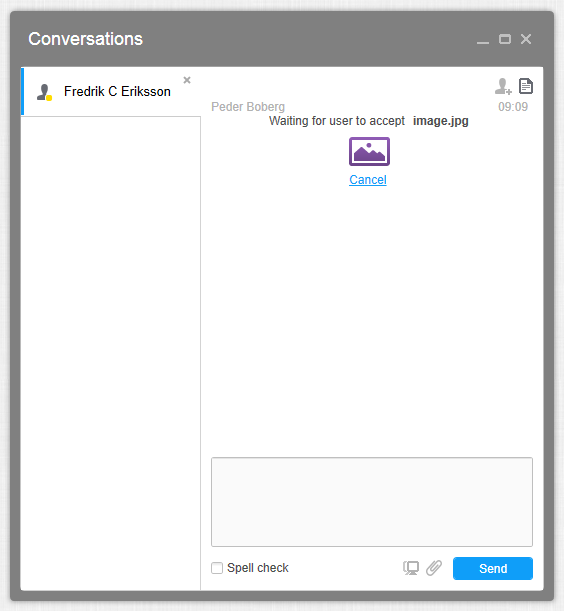 When the user has chosen Collaboration as the target of the image sharing, a dialog will appear where the user has to choose whom to share this image with. 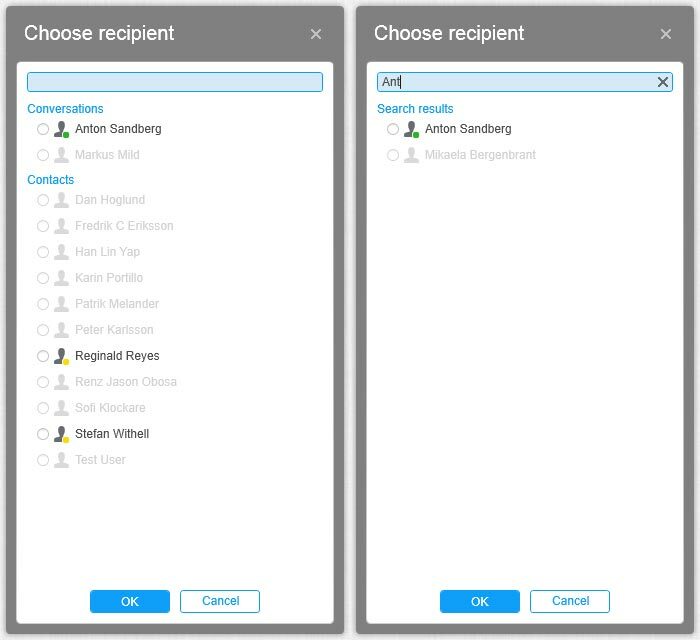 The left hand image is the initial view where all of the users’ contacts are displayed and any ongoing one-to-one conversations pops up on top. The right hand side shows the search result for the text “Ant”. When we choose a contact and click the OK button, a new or existing, conversation dialog is opened and a transfer message is added to the conversation. 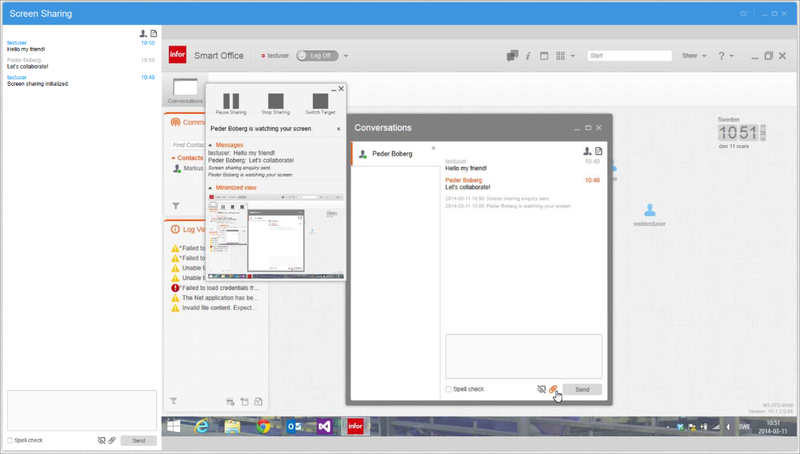 Another new feature in Smart Office is the notifications. They appear for a short amount of time in the top right corner of the screen and displays different text messages. The example below shows a notification that is displayed when a chat message is received. If the user choses to interact with the notification, i.e. by clicking somewhere on the notification that is not the close button, the related conversation is shown. Whether to show notifications or not is a setting that can be set in the related application settings, i.e. these notifications can be toggled under the tab Collaboration in Smart Office Settings. Amazing work! Bravo as usual. Looks great. What version of 10.2 is required? We’re running 10.2.0.32 in our development environment and don’t see this new functionality. Is server-side configuration required? You have the correct version. There is some configuration but it should be enabled out of the box. You should however know that messages are sent over HTTP so you might want to use HTTPS. Per default the Collaboration server is started and it connects to port 8080. If that post is not accessable for clients or already in use you need to change the port setting to an available port. You should also check that the address to the Collaboration server is correct. Both these settings are grid properties that you find in the grid properties in the collboration section for Mango Server. Check the log on the Mango Server to see if there are any errors. There is also a Smart Office setting to turn collaboration off but everything should be enabled by default. I’m surry for the late reply. I’m not sure of the description of the issue you are seeing. If I’m using smart office is my collaboration icon yellow on my canvas all of the time? And all my contacts appears to be away as well? There are two logs that you can check for more information – the server log and the client log. The server log should contain an info message that says that the collaboration is started and on what port it is started. The Smart Office server will contain information if it is trying to connect to collaboration without success or if the collaboration server isn’t reachable. 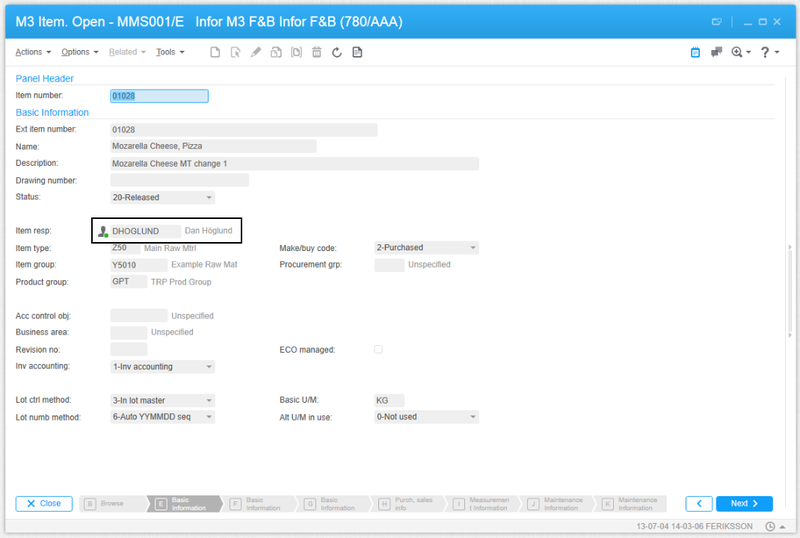 In Smart Office – enter settings and change the log level to debug. Re start Smart Office. Then enter dev:log in the start and search field to open the log. Search for Collaboration in the log to see if there are more hints and info since the information you provided isn’t enough. What about group/channel break messages? Similar to what was available in Workplace. Regarding channel messages. This feature was removed along with this update.